Cucumbers belong to the thermophilic cultures. So to grow they are best in a greenhouse where the vegetables will be protected from cold, rain and wind. But what about those who have a greenhouse at their summer cottage there? Do they have to give up juicy crunchy pickles. Not at all. Cucumbers can be grown in the garden, if you follow some simple rules. In order to grow cucumbers in the garden, the first thing to do seedlings. Planting seeds is carried out in plastic cups or small pots, filled with special nutritional soil mixture, consisting of sawdust, peat and humus. To fertilize the soil with ash and nitrophoska. Planting seeds of cucumbers it is better to do in early or mid-April. Once a week watering the seeds of cucumbers, filtered water. At a temperature of 20-28°C they are quite in unison begin to grow, and a month later after planting you will notice the emergence of seedlings. Immediately after the emergence of seedlings join in the search space for further growing cucumbers in the garden. Give preference to a lighted area, closed from the wind by fences, mesh or dense thickets of garden shrubs. It is better to grow cucumbers in the beds where it grew root crops, tomatoes, peppers, cabbage or onions. Keep in mind that the soil in the garden where you intend to grow cucumbers should have a minimum nitrogen content. 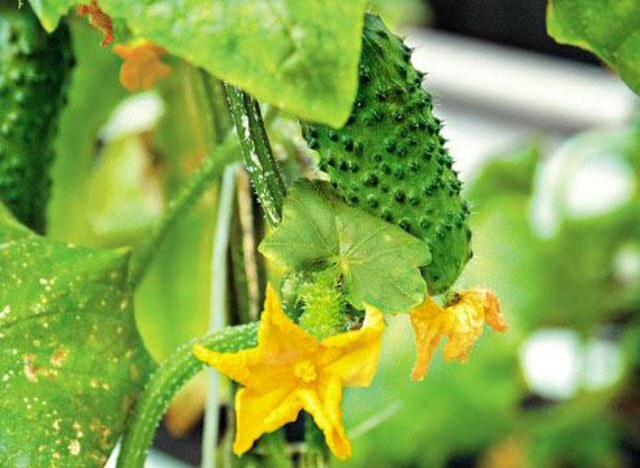 In order to grow cucumbers in the garden, try to create for their growth and development most favorable conditions. For this early spring collect from the site and its environs branches, fallen leaves, pine needles, straw, sawdust and peat. Mix the collected debris with a rake, form a smooth oblong pile, add hot water, shake and tamp disinfect with a solution of copper sulphate. Next, pour on the bed a layer of soil mixture composed of peat soil, sawdust, peat and compost, and carefully flatten it. The thickness of this layer should be 10-15 cm that will play the role of the soil for growing cucumbers in the garden. To create a greenhouse effect wrap the bed with plastic wrap and do not remove it until the moment of planting the cucumber seedlings. Transplanting of cucumbers on a bed of warm cooked produce in mid-may, subject to the established warm weather. If you plant cucumbers in insufficiently heated soil, they will die. For each plant dig an individual hole and fill it with mineral fertilizers: superphosphate, or nitrophoska. Pour a bed with the prepared hole with warm water and start planting seedlings. Once a month make dry root fertilizing, sprinkling the soil around the plants with any of your fertilizers. To increase the yield of cucumbers better suited to such formulations as "hero", "Supporter", "Berry" and "Giant". Don't forget to water the cucumbers. This should be done 3 times a week. At the stage of fructification are only watering-fertilizing with a mixture of slurry and mineral fertilizers.